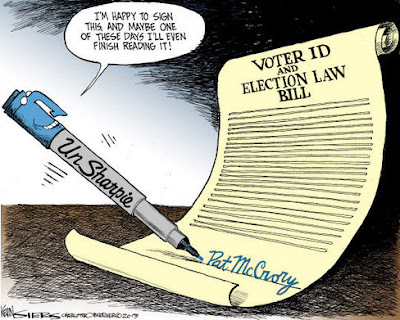 Gov McCrory announced he would sign the voter ID bill even though it became quite apparent at his press conference last Friday that he didn't actually know what's in the bill and is confused about some existing NC voter registration laws. WRAL: "An Associated Press reporter asked the Republican governor how three particular provisions of the bill would help prevent voter fraud — ending same-day voter registration, trimming the period for early voting by a week and eliminating a program that encourages high school students to register to vote in advance of their 18th birthdays." The reporter never got a direct answer to the question, but finally, when pressed about same-day registration, McCrory said, "There is plenty of opportunity for voter registration — online, offline, through many methods." "Online"? No, never in North Carolina, though other states offer that method. When asked specifically about the provision ending pre-registration by those under 18, McCrory said, "I don't know enough, I'm sorry, I haven't seen that part of the bill."